Science Classes & Creation Adventures! Prepare to cast off on an incredible sea adventure with this nautically-themed guide book that honors God as creator of the oceans and all that is in them! The Complete Aquarium Adventure: A Field Trip in a Book is divided into three sections. Before the Aquarium helps you prepare for your trip with organizational tips, planning recommendations, a packing list, devotionals, and more. At the Aquarium contains a "See the Sea Creatures" section that highlights many animals that may be found at an aquarium, giving information from a creationist perspective on birds, fish, invertebrates, mammals, and reptiles. After the Aquarium continues the learning experience with 35 reproducible activity sheets including a variety of games, puzzles, arts, crafts, creative writing ideas, and more for all ages. The book also includes a removable Tool Kit in the back to take along with you to the aquarium, beach, marine-life park, etc. 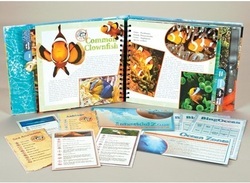 The tool kit includes 31 Animal Fact cards (corresponding to the animals featured in the "At the Aquarium" section), 7 Ocean Zone cards, 3 Aquarium Animal Alphabet Card originals, and 3 BingOcean Card originals. This "Field Trip in a Book" is an excellent tool for families, teachers, homeschoolers, and groups. The fun of a field trip has been bound up in a series that involves the whole family. Master Books, an imprint of New Leaf Publishing Group, adds its third title, The Complete Aquarium Adventure: A Field Trip in a Book, to this inventive line. Excellent photography of undersea creatures in their natural habitats accents the text. Puzzles, word games and educational activities that draw kids deeper into the experience of aquariums and oceanic realms - like constructing a diorama - make the book useful for homeschoolers as well as for interactive family times. Creationists and educators Bill and Merilee Clifton wrote the text that takes kids into the world’s water kingdoms. The Cliftons are qualified as Florida Master Naturalists - promoting awareness of the state’s natural world - and also founded Science Partners, teaching homeschool science classes and offering Creation Adventures (field trips and workshops) designed to introduce students to animals and nature. The Complete Aquarium Adventure is spiral-bound like Master Books’ previous “Field Trip” releases, which highlighted the Creation Museum and zoos. Master Books’ Editor in Chief Laura Welch said, "I think the success of these books can be attributed to being something unusual. They’re creation-based, special activity-focused products that tie in with great family destinations." Ask for it at your bookstore! Questions? Contact Bill or Merilee Clifton at 407-808-4458 (cell / text) or sciencepartners@cfl.rr.com. Copyright © 2018 by Science Partners LLC. All rights reserved.